This morning’s report on employment from the Bureau of Labor Statistics showed an economy strengthening more rapidly than even optimistic economists believed. For January the BLS reported 257,000 new jobs, well above the estimates. More importantly, the BLS revised its earlier estimates for November and December to 329,000 and 423,000 respectively. 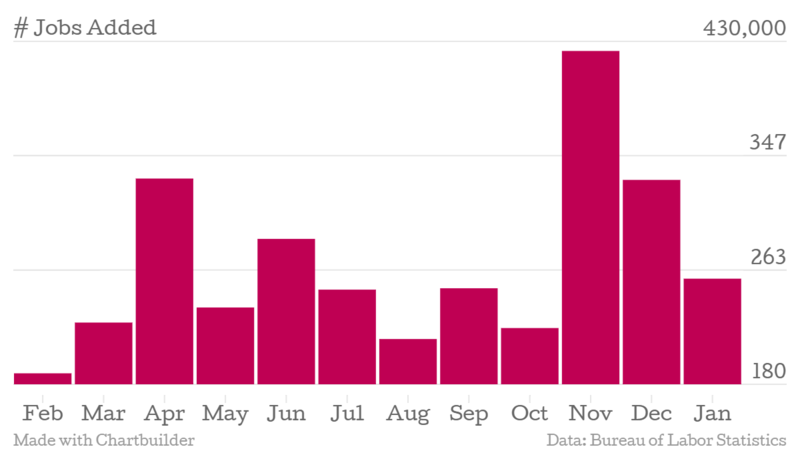 That is 147,000 more jobs than reported in an already strong fourth quarter. The average monthly jobs gain for that quarter was 336,000, the highest since 1997. As upbeat as the hiring data was, the report’s only negative note was actually the most positive. Unemployment rose from 5.6% to 5.7%. That uptick in unemployment was due to over 700,000 workers returning to the market. While many of those returning did not yet find employment, the labor participation rate jumped to 62.9%. Investors may react to the news negatively because it may signal an earlier move by the Federal Reserve to raise interest rates but as a barometer on the health of the economy, the increased pace of hiring has little but positive ripples. This entry was posted in National Economy. Bookmark the permalink.